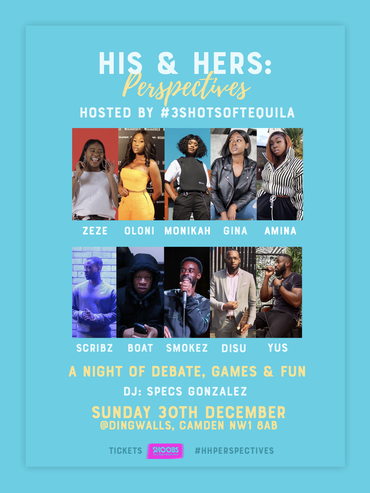 His & Hers: Perspectives is the new debate and games night centered around the different views of men and women. TICKETS ARE EXTREMELY LIMITED PEOPLE SO BE QUICK!! WE HAVE ADDED THIS SHOW DUE TO DEMAND SO BE QUICK, ONLY A LIMITED NUMBER OF TICKETS AVAILABLE. THERE WILL BE PLENTY OF SEATS AVAILABLE BUT DEMAND WILL BE HIGH. ARRIVE AS EARLY AS POSSIBLE TO BE GUARANTEED A SEAT. THOSE WHO ARRIVE LATE WILL HAVE TO STAND.